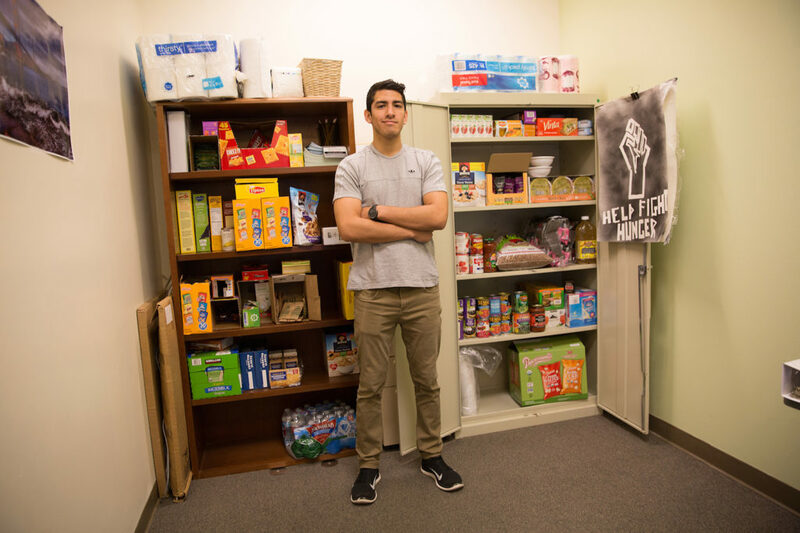 With 4 in 10 UC students unable to afford regular, nutritious meals, UC Santa Cruz takes a bite out of the problem with services ranging from free food pantries to help with signing up for state nutritional benefits. Sometimes, the only thing 20-year-old UC Santa Cruz sophomore Alexis Moreno had to eat all day was a bagel or a peanut butter and jelly sandwich. It wasn’t that she didn’t want to eat more. She would have loved to grab lunch or go home to a nice dinner. But the Kresge College psychology and sociology major faced a situation that, according to a July UC systemwide study, was shared by 4 out of 10 of her classmates. Because of the high cost of living in Santa Cruz, tuition and other educational expenses, tight family resources, and the need for a part-time job besides her full load of classes, Moreno, who grew up outside of Fresno to a farmworker father and a receptionist mother, didn’t always have the money or flexibility to eat like she should. The fact that cash-strapped college students might skip lunch or make a dinner out of ramen noodles is nothing new. What’s surprising is the sheer number of UC students who do not have a consistent source of high-quality, nutritious food—a startling 42 percent, according to the UC Student Food Access and Security study. At UC Santa Cruz, the epicenter of the organic food movement, the problem has already spurred a number of programs that include two free food pantries, budget cooking classes, affordable pop-up produce stands, emergency Safeway gift cards, and services that help eligible students sign up for the state’s CalFresh program, known federally as SNAP and formerly called food stamps. Even more ambitious programs that will allow students to donate unused dining hall meals to their hungry colleagues and to expand the food pantries are in the works. In addition, UC President Janet Napolitano pledged $151,000 for each of UC’s 10 campuses over the next two years to combat campus malnutrition. The funds are part of UC’s Global Food Initiative, which is working to address the issue of providing sustainable and healthy food for a growing population. “What’s important for those working on the ground level is ensuring the problem doesn’t become the focus rather than how we approach solutions to meet the growing student need,” said Tim Galarneau, a research and education specialist for the Center for Agroecology & Sustainable Food Systems who is co-chairing the Food Access and Security Subcommittee for the systemwide Global Food Initiative. For Moreno, the solution included emergency $50 Safeway vouchers from the Slug Support program that allowed her to buy healthy snacks that got her through a full day of classes and also purchase fresh produce to eat at her apartment. According to the UC study, which may be the biggest look at food insecurity on college campuses, 19 percent of students reported they sometimes had gone hungry in the past year. Another 23 percent said they had limited access to a variety of good-quality food because of a lack of money. In California, according to the U.S. Department of Agriculture, 14 percent of households face food insecurity. “It’s a mighty problem,” said Lorrene Ritchie, director of UC’s Nutrition Policy Institute and principal investigator of the UC study, which also showed 25 percent of food-insecure students had to choose between paying for food or educational or housing expenses, and that nearly a third of those in need said they had trouble studying because of hunger and a lack of money for food. The reasons behind the worrisome findings, said those who have studied the problem, vary from the aftereffects of the Great Recession to increased tuition and a high cost of living and, sometimes, to poor budgetary decisions the students make themselves. Roughly 42 percent of UC students receive Pell Grants, federal financial-income families, and more than half of UC students pay no tuition because of financial aid. UC also enrolls students from all educational backgrounds—44 percent of the system’s undergraduate populations are first-generation college students. But one only has to glance through Craigslist to find one of the biggest problems facing UC Santa Cruz students. A one-bedroom cottage a few miles from campus was recently being offered for $2,400 a month while a humble-looking studio apartment near downtown had a price tag of \$1,500 a month. The high cost is no surprise, considering Santa Cruz is one of the five most expensive rental areas in California, according to the National Low Income Housing Coalition. Bryan Montes, a second-year Kresge student studying computer science, is among the students working to set up one of UC Santa Cruz’s food pantries for the academic year. UC Santa Cruz Interim Dean of Students Lucy Rojas has seen the effects of the financial squeeze firsthand. Every day, students walk into the campus Slug Support office needing help because they’ve exhausted their resources and have no money to by food, or it’s the end of the quarter and their financial aid has run out, Rojas said. The office provides a free food pantry, emergency Safeway gift cards, and help for students who want to sign up for CalFresh. “I think it’s a significant problem,” said Rojas, whose office helped 281 qualified students sign up for CalFresh benefits during the last academic year and has plans to install refrigeration in the current food pantry so students in need can get more than pasta, cereal, beans, peanut butter, and canned goods. Another food pantry at Family Student Housing provided 25,632 meals last year during its twice-a-month distributions, according to Sue Matthews, associate vice chancellor for colleges, housing, and educational services on campus. Some 500 households were served. About two-thirds of the students who come to Slug Support for help receive some kind of financial aid for college, Rojas said, but the problem is that these students often have trouble coming up with the “self-help” portion of their aid. 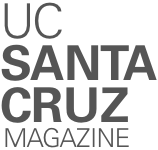 In what may be a reflection of the economic hit experienced by families during the Great Recession, the percentage of UC Santa Cruz students awarded Pell Grants—grants awarded to the state’s lowest-income students— was 26 percent in 2007–08. In 2014–15, that percentage surged to 45 percent. Add to that economic squeeze the fact that some students are financially helping their families at home while others may not have a family to fall back on, and some students have their backs against the wall. “I don’t think people really understand until you’ve lived it what it’s like not to know where your next cent is coming from and if you’ll be able to eat next week,” said Ella Goldberg, 24, a Kresge history and psychology major with a literature minor. Goldberg is a member of the Smith Renaissance Society, a program offering a pathway to admission to UC Santa Cruz for foster youths and other independent students such as wards of the court, homeless youth, and orphans. Like fellow Smith scholars who don’t have the traditional family support other students might, Goldberg has learned to get by. She’s found scholarships, taken out loans that also covered her meal plans on campus, and gotten help from Slug Support. She’s been resourceful, scoping out campus events that offer free food and taking advantage of the CalFresh program in order to buy groceries. In her case, she said, it’s the constant stress over the uncertainty of where her next meal might come from and not hunger, per se, that makes it hard for her to study. Studies, meanwhile, have shown that students who are food insecure are more likely to report feelings of depression, anxiety, and stress, said Suzanna Martinez, a researcher with the Nutrition Policy Institute in UC’s Division of Agriculture and Natural Resources. The UC study also showed students who were food insecure had a slightly lower GPA than their less hungry counterparts, and were also more likely than food-secure students to report that they had to suspend studies due to financial hardship (10 percent vs. 3 percent). Sitting in his cramped Oakes College office, Galarneau ticks off the pantries and food programs offered at UC Santa Cruz, including weekly pop-up produce stands that accept CalFresh cards and provide low-cost fruits and vegetables, along with provisioning workshops that teach students how to prepare nutritious meals on a tight budget. One of the UC student food access survey’s findings was that 57 percent of hungry students were experiencing food insecurity for the first time in their lives, suggesting they might be helped not only by workshops like those offered by UC Santa Cruz but also by ones that teach financial literacy. Starting in 2016–17, UC Santa Cruz will begin to offer a Swipe for Slugs program that will allow students with meal plans to donate unused meal credits to their hungry cohorts. The key to success, said Galarneau, is not only setting up programs but also letting students know what help is available for them. As for the UC system, the Global Food Initiative Food Access and Security Subcommittee suggested adding food preparation and storage space into new student housing construction and design, setting up access to mobile kitchens, and providing more communication about housing and food costs to incoming students among possible solutions. Donations to the UC Santa Cruz Student Assistance Emergency Fund offered by the Slug Support program can be made online.